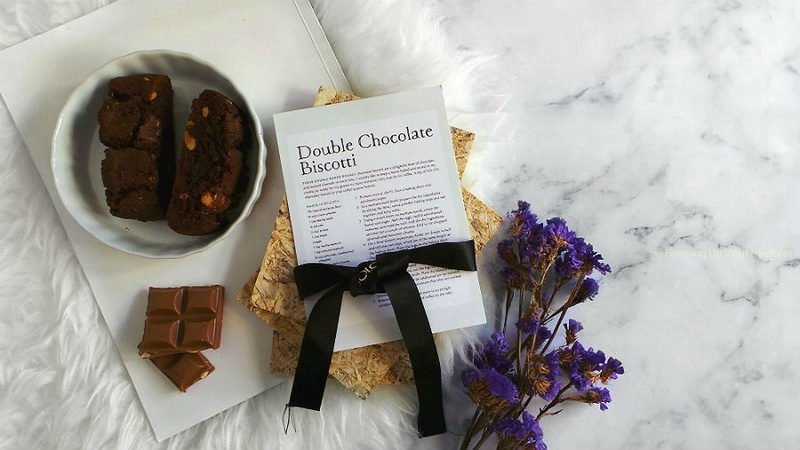 Receiving a box filled with beauty goodies every month is just wonderful, right? Glambox is a subscriptions based beauty service available to the residents of UAE. 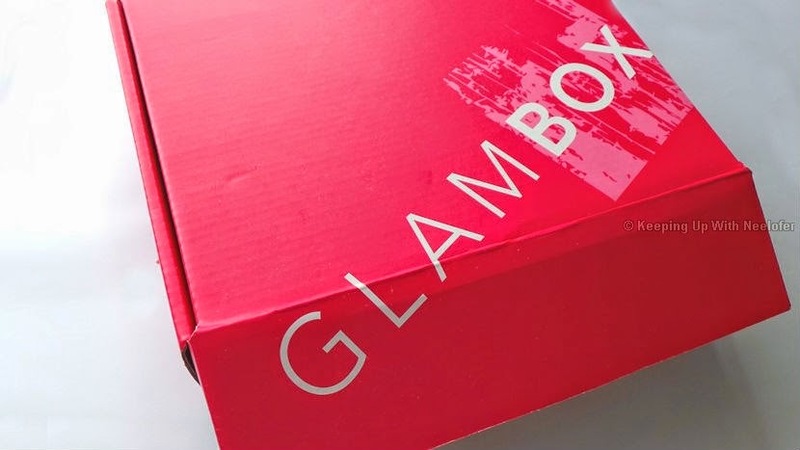 Glambox is literally a glamor box that helps you discover different beauty products and services for a nominal fee. While some products are available in sample sizes, the others are full size thereby permitting you to test out a product prior to purchasing it. Glambox provides 3, 6 and 12 month subscriptions. My readers have a special 25% discount- use the code GBNEELOFERto avail this discount. Sign up here. The April Glambox is filled with interesting products. There are vouchers, skin smoothing creams, an eye shadow and so much more! I was delighted to see Dove as part of this box. It is one of my favorite brands- I think I've tried almost every Dove product there is. In addition to this, I was pleasantly surprised to discover one of Glambox's new offerings- their own makeup brushes! Hawaiian Tropic Silk Hydration Protective Sun Lotion with SPF 30: I dread the summer season. My skin tends to burn easily...let's just say the sun and I are not on talking terms. 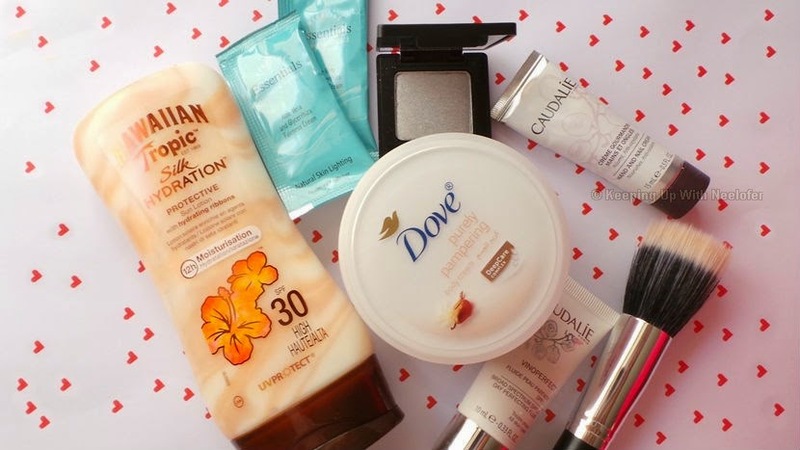 Needless to say, I'm a huge fan of sunscreen lotions and have a few of my favorites. The Hawaiian Tropic lotion promises to protect under the sun with SPF 30 while keeping skin moisturized for hours. It has a sweet fragrance to it and the best part? It does not leave a greasy finish. This product sits in my car now. Herbline Essentials Fairness Cream: I actually received the (full size) product from Herbline a few weeks ago and I've put it to test. Watch out for a post with my full review on it. To summarize, this cream targets pigmented areas on the face and aims to lighten them. It is slightly thicker in consistency and has a wonderful fragrance. More about this once I complete the test period. Inglot Freedom Eye Shadow: This is such a gorgeous silver eye-shadow. It stays put for hours esp. when you have primer on and makes your eyelids dazzle. This is the first time I use Inglot products and it didn't disappoint. Dove Purely Pampering Body Cream: Aaah Dove. What can I say more about one of my favorite brands? This cream in particular is infused with shea butter and keeps skin moisturized and silky like a baby's. Dove can do no wrong in my books. I love it. Glambox Stippling Brush: Great for liquid foundations, this brush helps the product go on smoothly so you achieve an airbrushed finish. The bristles while on the softer side, does the job perfectly well. 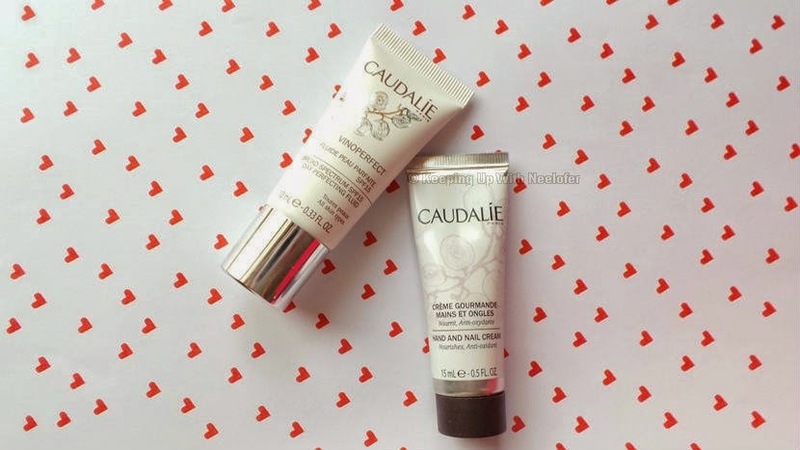 I was quite excited to have gotten my hands on Caudalie products. I've heard so much about the brand and this was my opportunity to try it. I tried the Hand & Nail cream first. Made from orange pulp and almond powder, this cream works to keep your hands and nails nourished at all times. While I love oranges (they are one of my favorite fruits) and love the fact that they are included in some of my skincare products, I found the fragrance of this cream a little too overwhelming. Apart from that, the cream is absorbed into the skin leaving my hands smooth. The Caudalie Vino Perfect Day Perfecting Fluid is an oil-free facial moisturizer packed with skin perfecting benefits. I have yet to try this. In addition to all these products, I received 2 vouchers- Nstyle offered a polish change and Wellbeing Medical Center gifted a AED 500 voucher. If you loved what you saw and read, sign up today! Use the code GBNEELOFER to get 25% off your subscription! Inglot Freedom eyeshadow is really beautiful.